On October 30, when the Czech Republic declared itself independent, a military unit of former soldiers and Austrian-Hungarian officers was formed in Prague, whose main purpose was to organize and leave immediately for Transylvania to help the new Romanian authorities there. Thus, the Romanian Legion in Prague was formed. This new military unit helped, first of all, in upholding Czechoslovakia’s declaration of independence, but also in defending this decision until the Czechoslovak army was able to regroup and reorganize. Immediately after the last failed attempts of the Austro-Hungarian Empire to reform itself, the Legion considered its mission completed and headed to Banat and Transylvania, crossing Austria and the Kingdom of Serbs, Croats, and Slovenes. On Serbian territory, however, the Romanian Legion in Prague was met with hostility, being disarmed and thereby prevented from helping in strengthening the Transylvanian army. In the last days of October 1918, a favorable environment to the gathering and organization of the Romanian soldiers fighting for the Austro-Hungarian army was created in Prague. Thus, among those who formed the Romanian Legion in Prague were the 2nd Regiment of Braşov (stationed in the Franz Joseph garrison), a part of the 51st Cluj Regiment (Romanians made up more than half) and the 37th Regiment of Oradea (stationed in the Albrechts barracks). One of the measures that the Legion took against the Austro-Hungarians was on October 28 when the Czechs occupied the main administrative institutions, and the Romanians refused to shoot the Czech demonstrators. Encouraged by the speed with which the Czechs declared their independence, the Romanian troops organized an expeditionary corps to travel to Transylvania to let the new Romanian authorities know that they are at their disposal. Thus, on November 1, 1918, the Romanian Legion in Prague was formally constituted out of the three predominantly Romanian regiments (to which there were also added Romanians from the Romanian Kingdom who had fallen prisoner), everything being decided in a meeting in a German school, and on November 3, in its gymnastics hall, the Romanian flag was sanctified and the soldiers swore an oath of allegiance to the Romanian nation in the form established by the newly created Central Romanian National Council. The Legion numbered 1425 soldiers at the beginning, but its ranks multiplied with the ceasefire on various Austro-Hungarian fronts and with Romanian soldiers heading back home. In less than a month, in November 1918, the Legion organized itself, ensuring it had necessary provisions to accomplish what it had proposed. As a reward for helping them gain independence, the Czechoslovak National Council provided the Romanians with weapons, food and medicine. The leaders of the Romanian Legion in Prague subordinated themselves, through a declaration, to the Central Romanian Military Senate of the Officers and Soldiers in Vienna (directed by the deputy of the Romanian National Party of Transylvania, Iuliu Maniu), a body that set out to group and organize Romanian soldiers and officers in the West of the Austro-Hungarian Empire around it and in this effect had sent a delegation (consisting of Petru Popovici and Emil Colbazi) to Prague on November 1. To collaborate effectively, the Romanian Legion in Prague sent a delegate as a member of the Central Romanian Military Senate. 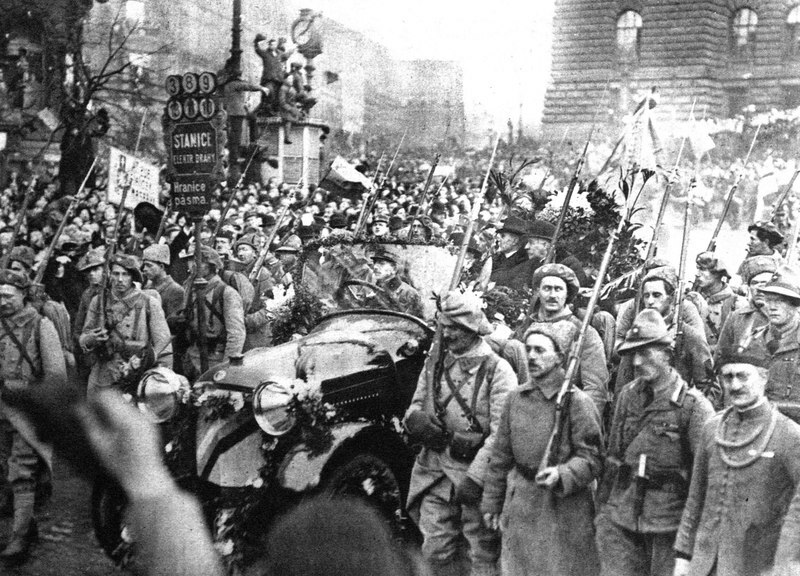 At the end of November, after peace was restored in Prague, the Romanian Legion, at the request of the Czech Council, considered helping the Czech military to liberate Slovak territory from Hungarian troops. But it was all abandoned when they received the news of the Great National Assembly at Alba Iulia- they immediately left for Romania. On departure, the Czechoslovak National Council had put at the disposal of Romanian soldiers a train, money needed to cover the transport expenses, as well as the necessary equipment and weapons. Also, in order to facilitate the trip, the same council issued a letter of recommendation to the Serbo-Croat-Slovenian authorities. On November 25, 1918, they arrived in Zagreb, where they were disarmed by Serbs, due to the still unclear status of Banat. A few days later, the Romanian Legion in Prague would arrive in Cluj, where it was disbanded. Members of the organization then joined the Romanian National Guard and the Romanian Army of Transylvania. 1918 nov 3. /vagy 4-én,máig tisztázatlan/Torinóban alá írkát a fegyverszüneti megegyezést Magyar részröl a magyar király nevében,Az Osztrák fél Novemberben formailag eltűnt,mondván IV Károly a magyarok királya,arra tett esküt,ők kiszáltak a Monarchiából.Az áláíráskor nov 3.-án büzlőtt az árulás szaga,4.-én be is bizonyosodott,Az Antant 4.-én is támadott,mondván ,úgy értelmezték 4.-én kezdődik a fegyverszünet.Igy fogságba esett 300000 katona és odaveszett minden hadfelszerelés,az olasz fronton.Megkezdődhetett a hadi fogjok szétválogatása. Hová tűnt az Osztrák császár? hát az bizony csak a mesében volt,mióta Napoleon a koronáját és a legszebb lányát elvitte, így történt régen, de ma is igy emlegetik az uraklodó Budán Király,Bécsben Császár volt.